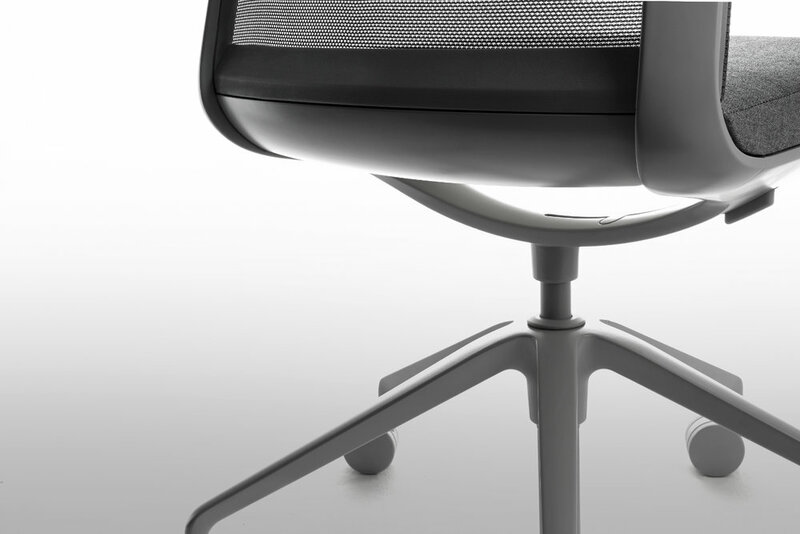 Work and conferencing elevated - F4 is a multipurpose chair for use in meeting rooms and collaborative spaces. The aim for this project was to create a refined chair through a form language that could be defined with a single line. It was to be something new for the client, new for us and new for the industry. The chair called for a very specific range of motion with very little adjustment coupled with an extremely comfortable sit. This became the essence of the chair, and was largely influenced by the low profile suspension configuration used by Corvettes since the 1960’s. It is achieved through a cast yoke that accommodates the mechanism and keeps it contained in its rails while leaving the seat area open below to flex freely. With a limited range of motion there presents an opportunity to create a form that reads as monolithic - here the location point for the pivot for the back, and the connection of the rear portion of the seat to the back creates a condition whereby an opening is never presented between the seat and back through its range of motion. F4 won GOLD for Conference seating at Neocon2017. F4 represents an evolution in user-responsive seating. Through thoughtful material selection and component design, F4 was created to comfortably and effortlessly move with its user and support a broad range of seated gestures without requiring manual adjustments. In addition to its functional agility, F4 offers a graceful, lightweight appearance and timeless styling that support a spectrum of environments.